Scooter’s Coffee teamed up with the 19 North community to clean up 19th Avenue from Dunlap to Montebello during the “Love Our Community” event, held on Feb. 11. 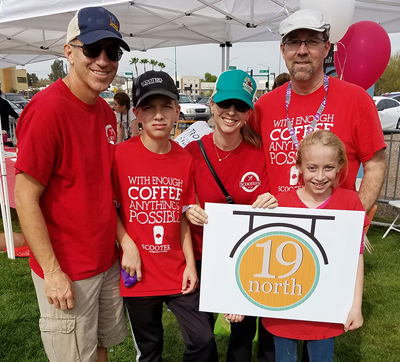 The team from Scooter’s Coffee that helped clean up 19th Avenue during the ‘Love Our Community’ event last month included franchise owner Mark Stevenson, right, his daughter Jamie Wilson (next to him), and her family: husband Kirk, son Erik, and daughter Kalista (submitted photo). Scooter’s Coffee owners, staff, and their families stepped away from the espresso machines and put on their work gloves last Saturday. With help from more than 100 Washington High School students, local businesses and churches, they scattered out along 19th Avenue ready to pick up litter and beautify the neighborhood. By the end of the morning, dozens of garbage bags full of trash lined the sidewalks, and the community gathered at Open Door Fellowship Church to celebrate. With many more community events and opportunities to come, including a business alliance designed to encourage new businesses to take root in this vibrant, up-and-coming area, Stevenson and his team at Scooter’s Coffee are excited to be able to take an active role in its rebirth as a great place to live, work and invest right in the heart of Phoenix. Scooter’s Coffee, based in Omaha, Neb., is a fast-growing coffeehouse with over 150 locations across the Midwest and South. Stevenson’s Scooter’s Coffee franchise is the first to open in Arizona. For more information, visit: www.scooterscoffee.com.